Why do you need a pre-departure checklist for your vacation? ...or worry about your house. Some of these things will be done close to travel time, but you need to think about some of them weeks in advance. Getting shots and passports and visas can take time. Make a pre-departure checklist when you start planning your trip if you haven't traveled all that much. We have a checklist that we go through every time. Let's deal with what you need to think about before you pack for that trip. The first thing we're going to tell you is to check your passport if you're traveling internationally. That seems obvious, doesn't it? Is it current? And is it valid for 3 or 6 months after your return? Some countries require that! Do you have enough blank pages? 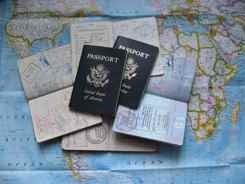 Do you have the proper visas if the countries you're visiting require them? Do you have extra passport photos if you'll be getting visas abroad? They shredded their NEW passport, and came with the old one. So check your passport. Make sure it's current. Check to see if you have all the proper visas, if necessary, for the countries you will be visiting. Get any required or recommended vaccinations and medications. Check well ahead to see if you need international travel vaccinations. Some of these are a series and require time to become effective. Do you need to get a prescription for malaria pills? Make sure you have plenty of any prescription medications you take. It's a good idea to pack more than you will need in case you're return is delayed. Pack an extra pair of glasses or extra contacts. Get copies of prescriptions for eye glasses and prescription medications. This could help you if they're broken or lost... and prescriptions take up no room in your luggage. Paper airline tickets are pretty much a thing of the past... but... we've still come across them from time to time! Make sure to check which kind of airline tickets you have. If they are paper tickets.... take them with you. If they are e-tickets, print out the confirmation and take THAT with you, so you have proof of what you purchased and where you're going. What else should be on your pre-departure checklist? Find out what your daily ATM withdrawal is. If you ask for £300 and your limit is $300, you're gonna be denied. Carry enough cash to get by if you need to, but not TOO much. We don't convert currency ahead, but you could if that makes you feel more comfortable. We don't carry traveler's checks any more... too hard to cash them, but... If you're carrying traveler's checks, make sure the documentation is safely stored in a separate place. Tell your credit card companies and the bank that issues your ATM that you'll be traveling. It's good for them to know where you'll be traveling and the dates so they won't think there is fraud going on. And speaking of credit cards... choose one or two and leave the rest at home. We take our AAA Card and (I hate to admit it) our AARP Card. Get and International Driver's License if necessary. Some countries require it, so check ahead. It's not hard. Here in the U.S. the AAA issues them. Take your auto insurance card with you. Check your credit card... many of them include insurance for car rentals for a couple of weeks if you use them for the car rental. Do you have plenty of memory for your camera? We had friends who took 11,000 (!!) photos on a safari. That's a lot of memory! Make sure you have the adaptor plugs you need so you can plug anything in. Do you need an international plan for your phone? Be sure you understand what it will cost... and how to avoid big roaming charges. Along with any emergency contact numbers you might have. Not just so they can follow along with you, but so they can contact you if need be. When it comes to your travel safety, there are some things you might want to add to your pre-departure checklist. Check Travel Advisories - If you're planning to travel to areas where there has been some unrest or health issues, you might want to check on travel advisories. Get The Embassy's Number - Find out the address and phone number of your country's embassy in the country you are visiting. Register With The Embassy - Some governments suggest that you register with the embassy so they know you are in the country. The U.S. State Dept. calls it a STEP program. We don't always do this, but it makes things easier for your embassy if there is a natural disaster or general emergency. Health Insurance - Does your health insurance cover you abroad? Should you by travel insurance? Money Belts - Keep cash, credit cards and valuable documents in a money belt when you're on the road for safety. There is a lot to think about when you're getting ready for a trip. These are only suggestions. Make your own pre-departure checklist. Make a pre-departure checklist for making your home secure during your trip too. If you take a little time for this, you'll leave on your trip knowing you've got things under control... then the other little travel surprises that might crop up will be easy to deal with.